New Burnley branch now open on the high street and opening hours changed across three branches. 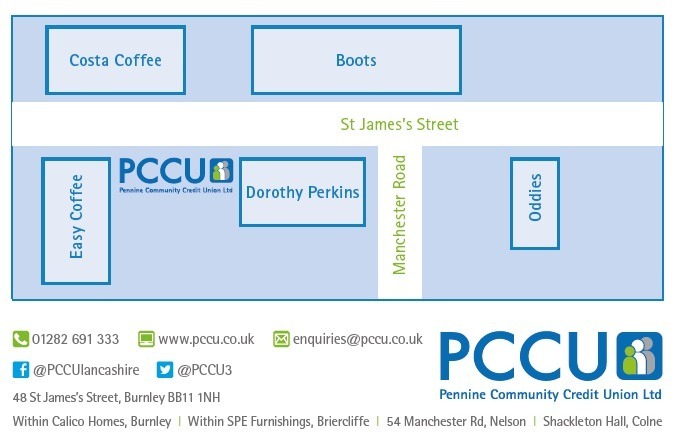 PCCU has totally renovated 48 St James’s Street branch situated between Dorothy Perkins, the bustling coffee shops and Banks which line the high street. We have also altered the opening hours across the three branches in Nelson, Colne and Burnley to allow more account holders to access accounts. The new Burnley branch has a purpose built cashier counter and interview room, which will allow us to provide the same great saving and borrowing services to more people in the Burnley and Pendle community. This should have no affect for our account holders, who have no need to change any methods of depositing. We will still be available on 01282 691333, on our website, via email and also through PCCU’s social media platforms. 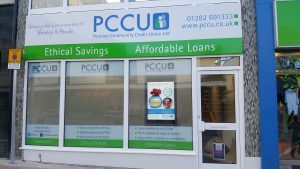 PCCU have decided to alter the opening hours across the three branches. The Burnley branch will open on Saturday morning from 09:30am until 12:00pm to allow account holders from the Burnley area to request withdrawals, talk to staff and apply for loans. The Colne branch will no longer open on Saturday morning, account holders from the Colne and Nelson area are asked to use the Nelson branch which will also open on Saturdays but will also close at 12:00pm. All three branches will open on Tuesday at 12:00pm. This will only effected account holders that use the Nelson branch which previously opened at 11:00am. These changes will allow PCCU to process more efficiently and offer a better services across the communities we service. PCCU are thankful for the facilities provided by The Calico Group over the past 5 years. Whilst there 1200 local residents from the Burnley community have opened savings accounts and local residents have accessed over £2.1million in affordable loans. We are sure the next chapter in PCCU’s history at 48 St James’s Street will be as beneficial for the local community. Pop in and say hello at the new branch. If you have any questions please contact PCCU. "PCCU are always there for me when something goes wrong with my car, thank you"
"Been with PCCU for years, friendly staff that always explain everything"
"I like PCCU because they are ethical; I sing their praises to everyone." Is it too early to open a Christmas Savings Account?